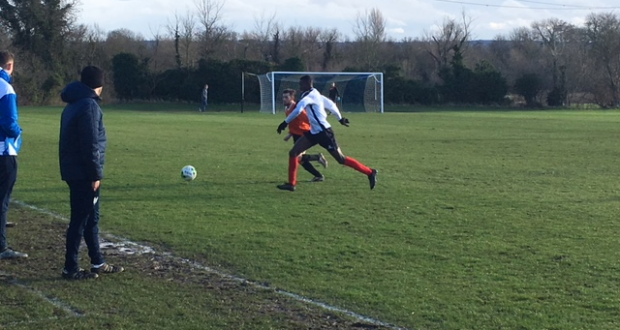 Goals from midfield pairing Yaw Ofosu and Jaedan Potts, followed by substitute Saif Akhi, were enough for KUFC to ease past Chichester 3-0 on Wednesday 31st January. 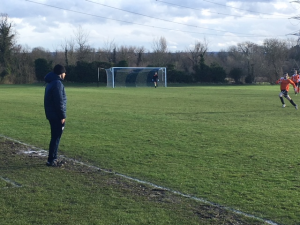 The home side were hoping to keep within touching distance of London’s School of Economics, at the top of South Eastern division 4C, who were five points ahead at the start of day’s play. The last meeting between the two sides was a strange one. KUFC won 2-1, courtesy of goals by Santi Navarro and Pranav Thapa, in an hour-long friendly due to no qualified officials attending the game. After a shaky start, the home side enjoyed the majority of possession in the early stages. A Chichester counter from a Kingston set-piece was the closest any side came to a breakthrough in the opening 15 minutes. Good play from Greg Potts advancing from centre-back created a flowing move from the home side in the 20th minute as Mo Sesay and Marco De Sousa combined to set free Kelvin Adjei, but Chichester’s keeper was alert off his line to mop up the through ball. Good forward play again from Adjei forced Kingston’s first corner of the game which was again well dealt with by the visitors keeper. Adjei was really coming into the game and a good run from him resulted in a shot being fired into the side netting. 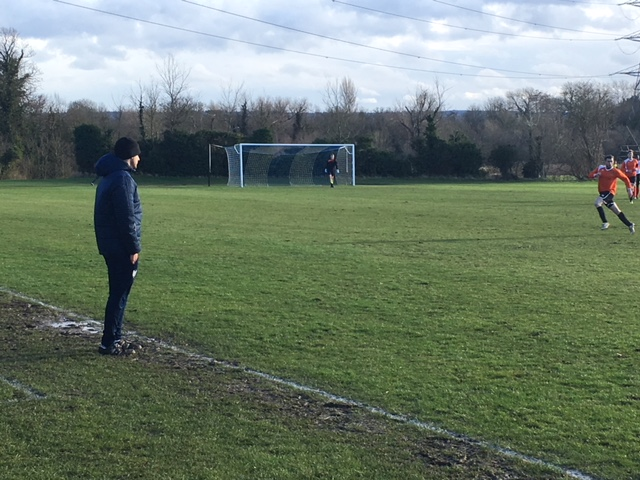 Despite Kingston’s dominance in possession, the visitors continued to ask questions, using the strong wind to their advantage by constantly firing balls over the Kingston backline looking for their striker. The home side’s growing pressure meant Kingston made the breakthrough in the 34th minute. A looping ball from a set-piece by Sesay found centre-midfielder Yaw Ofosu at the back post. Ofosu was unmarked and had run through a crowd to beat the offside trap. He got the finest of touches on the cross to deviate the ball past the Chichester keeper just outside the six yard box , allowing the ball to trickle into the bottom left hand corner. Cougars went into the break with a narrow lead thanks to Ofosu’s vital touch 10 minutes from half-time. Kingston were comfortably the better side with Chichester’s only real threat being the long ball over the top. Jaeden Potts drove Kingston’s first effort on target in the second half from 20 yards out, but it was well tipped round the post by the Chichester keeper. Sesay also drove a powerful effort from outside the box that was well dealt with by the visitors keeper in the first 15 minutes of the half. Kingston inevitably doubled their lead just past the hour mark as Sesay and J.Potts combined. Clever work on the right-wing from Sesay allowed for a pin-point cross for the unmarked Potts on the penalty spot. Potts replied with a sumptuous header into the left-hand corner to earn a vital second goal just as Chichester were threatening for an equaliser. J.Potts on his goal: “We do it all the time in training so its nice to see it come off in the match, it was such a great cross from Mo to find me, perfect. Substitute Gurpz Tatla missed two golden opportunities shortly after coming on to make the home side’s lead even healthier. Kingston eventually added a third as substitute Saif Akhi swept home a flowing move from the home side to add gloss on the scoreline. It was richly deserved as the majority of the second half was one way traffic. The Cougars will next face Reading for the 2nd time in three weeks looking to avenge a 2-1 defeat.